Morgan O'Brien is the CEO of pdvWireless. He co-founded Nextel, serving as its chairman from 1987-1995 and as vice chairman until its merger with Sprint in 2005. What makes one idea, enterprise, or initiative more "innovative" than another? Dictionary definitions don't help much — "introducing something new" and "featuring new methods; advanced and original" don't come close to what innovation means in today's world, especially in the context of the Fortnightly Top Innovators 2018. The meaning is insidiously flexible. Like some other buzzwords, "innovative" is particularly adept at taking on the meaning preferred by the person hearing it, whatever the speaker's intent. Respondents to my own informal survey - all of whom work in technology in one form or another — were remarkably consistent in their views. They reliably added to the dictionary definition's focus on newness an element of usefulness and meeting a need, always creative, usually impactful, and frequently disruptive. In selecting among the Top Innovators nominations, I tried to apply this more nuanced, perhaps more current view of innovation. But even with this fairly detailed definition, the speaker's intent may not survive the hearer's assumptions. Specifically, when you hear that an innovation is useful and meets a need in a creative way, you presume that the innovation is an overall good and should be widely adopted. Though I consider myself an innovator, I have come to believe that in many cases and for many good reasons, the innovative approach is not necessarily the right one. From the seventy-one initiative-specific submissions nominating a total of about two hundred individuals, I sought creative approaches that address major utility industry challenges in ways that will have widespread, positive effect beyond their own enterprises, preferably in the face of institutional obstacles. Recognizing that one organization's boon may be far less attractive to another, I sought initiatives that I thought would do the greatest amount of good. The breadth of an innovation's positive impact is necessarily limited by the institution's resistance to change. And frankly, that's a good thing. Utilities have expended tremendous effort and resources developing their infrastructure and operations; they are understandably and appropriately careful when it comes to adopting disruptive ideas or technologies. It is important for people like me to understand that this institutionalized reticence is not a manifestation of resistance for resistance's sake. Rather, each enterprise diligently evaluates the particularized impact of a proposed innovation, and the more disruptive the proposal, the heavier the burden of persuasion — as it should be. The nomination of engineer Cole Crews for his work in developing a private LTE pilot network for Ameren Corp. stands out to me for meeting all of the above criteria in spades. (Not a surprising choice for me, a wireless industry veteran.) The pilot is the first really concrete step toward solving utilities' decades-old challenge of obtaining reliable, secure, interoperable transport for control system data. With accelerating grid modernization driving an exponential increase in the amount of data utilities rely upon, this initiative could not come at a better time. By pairing LTE broadband technology with 900 MHz spectrum and thus gaining access to a vast ecosystem of available devices, Crews is applying an "advanced and original" approach to a long-standing problem, creatively meeting an undeniable need in the industry. 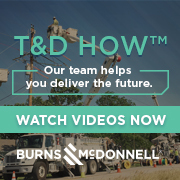 For many utilities, implementing a similar network can be disruptive and, over time, may render obsolete a plethora of legacy, application-specific communications systems (Ameren maintains over a dozen). It is clear to me, however, that utilities across the country will find the value of the new network more than outweighs the disruption it causes for this reason. Without a robust wireless broadband platform, they will be unable to fully realize the vast benefits of smart grid capabilities, both known and yet-to-be imagined. The Ameren LTE project, though only a pilot today, may show the way to broad deployment of 900 MHz private LTE networks by other utilities, forming a nationwide, interoperable broadband capability that improves efficiency, security, and reliability of our critical infrastructure. In short, I believe it will do a tremendous amount of good. In my forty-eight years in the wireless industry, I have witnessed substantial change and contributed where I could. Looking back, it strikes me how quick we have been to recommend a new wireless technology as a game-changing innovation — almost regardless of the business you are in. Innovation is not a panacea, but I am convinced that if we are to become more efficient, more productive, and continuing improving as a nation and a world, we must always innovate. In 2014, when we discovered prime radio spectrum available for sale, my colleagues and I at PDV began a slow, methodical study of the electric utility industry, which holds neighboring spectrum in large parts of the U.S.
As 2018 nears an end, we have garnered an appreciation for the size, complexity and importance of the electric grid. We continue to study the modernization of the grid and are persuaded that change must be affected in careful increments. The U.S. power grid has been called "the largest man-made machine ever built." I'm in awe of the armies of engineers and technicians who "keep the lights on" across this vast country. My objective is for PDV to play a constructive supporting role in the evolution of this miracle of technology and innovation. Ultimately, it falls to each utility, and the industry as a whole, to decide the success of an innovation — whether the good it will do outweighs the cost of the disruption it will cause.